If you wear this costume you get free entrance to a number of historic sites. You also get free entrance if you are over 64 and show them your NZ drivers licence! Andrew is cheap to run on sightseeing, not so cheap with his fine food and wine needs! 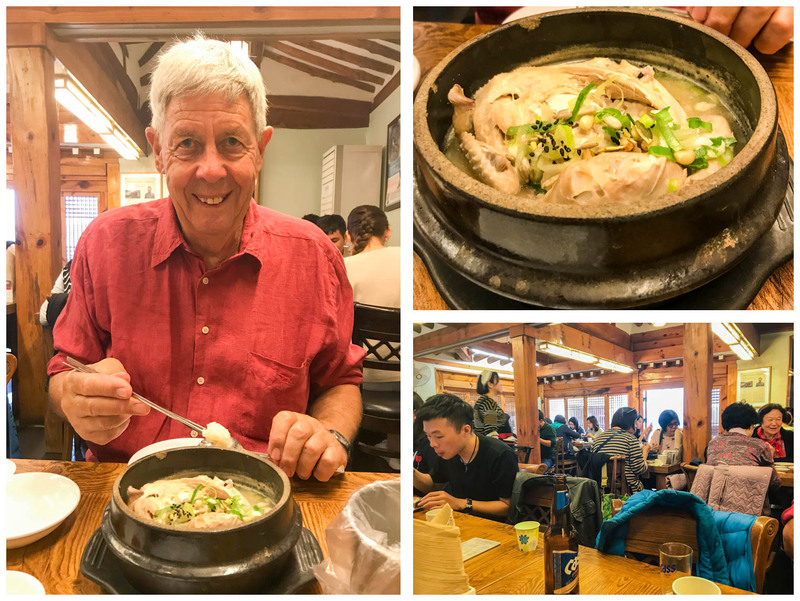 We went to a very popular restaurant nearby for a local specialty – Ginseng Chicken at Tosokchon Samgyetang. A whole chicken (small chicken) is stuffed with glutinous rice, red dates, garlic, a chestnut and ginseng, in a milky coloured ginseng broth. It is supposed to be very good for your health, probably much better than fried chicken anyway. The flesh did just fall off the bone and we shared the experience with 400 of our closest friends in a very busy, slick operation. There was a queue of 40 people behind us as we went in and just many still waiting when we came out. 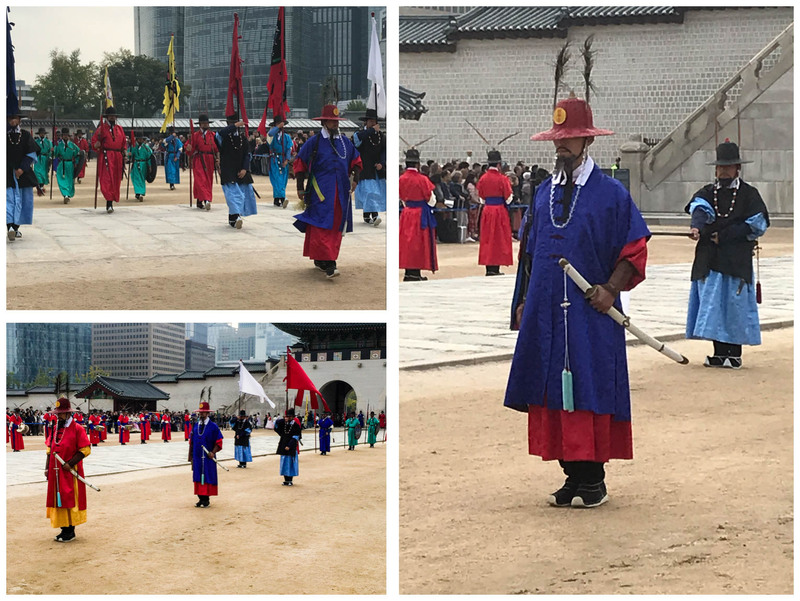 After lunch we walked to the Seoul History Museum. It wasn't very busy and free entry so when we spotted a lift we headed to the third floor following our normal routine of doing the floors and walking down the stairs. On the 3rd floor we almost felt like we shouldn't be there as there were lights being replaced and lots of maintenance work happening. But no one stopped us so we kept wandering. When we got to the stairway we found it blocked off – it we had walked up the stairs we wouldn't have got to the 3rd floor – never mind we saw some interesting stuff. The area on recent Korean history and in particular the redevelopment of Seoul post 1950 was particularly good. It was noticeable that the negative aspects of redevelopment (sanitation, food shortages etc)were only presented in Korean not translated to English. 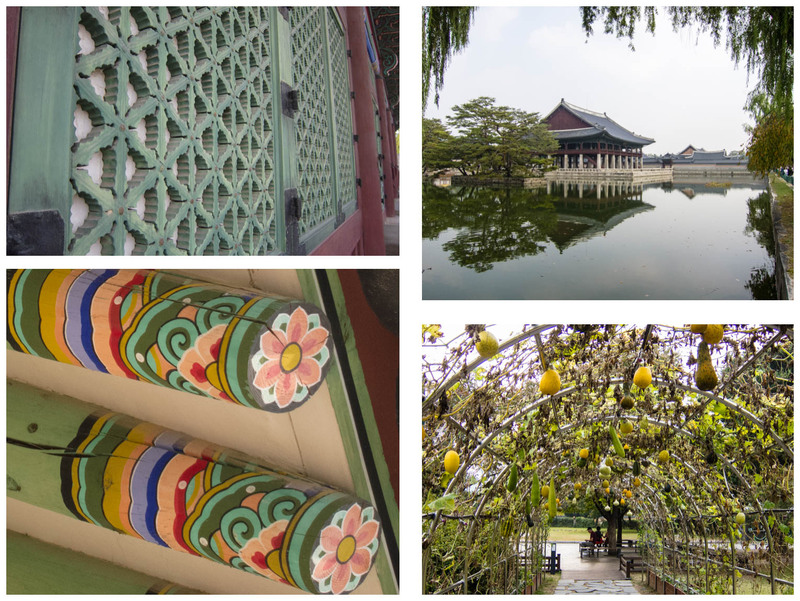 Our final day was staying in our neighbourhood and going to the nearby Changdeokgung, particulalry for the Garden which can only be access by going on a tour. To make sure we got on the 10:30am tour we arrived before 9:00am to get one of 50 tickets available. Andrew’s senior discount was extended to me, so our entry tickets were a bargain! We walked around the nearby traditional area. One nice characteristic was the photos displayed in front of the stores of the people who the stores belonged to, creating a feeling of reality, in a highly touristed area. We struck it lucky with the tour, because they said we could self-guide if we didn't want to trail the guide. Andrew and I headed off and it was delightful not to be walking with a big group. The autumnal colours were even more evident here. Then off for a final dumpling experience before on the train and back to the airport. Surprisingly there are direct flights from Vientiane to Seoul. In fact there are three Korean airlines offering daily flights. They do leave VTE at 10pm or close to midnight and arrive into Seoul between 5am and 7am [5 hours flying time] but that suited us to head up after work on Friday and be back early evening Tuesday. In Vientiane we walked downtown for an early dinner, before using Loca, the local equivalent of Uber for the 1st time to get us out to the airport. I managed to drop my APEC card somewhere before immigration, and only realised after I had been stamped out of the country. But the officers let me wander back through the immigration hall and security screening where I found it lying in the middle of the walkway. APEC card retrieved I went through screening and the guards smiled and waved me through to the waiting room. At Incheon airport we picked up our wifi device, and checked our metro journey to the city. Early morning on the train we had no problems getting a seat. We checked into the hotel and proceeded to breakfast and then have a lie down for an hour or so. “Refreshed” it was off into the lovely autumn temperatures of early 20s. 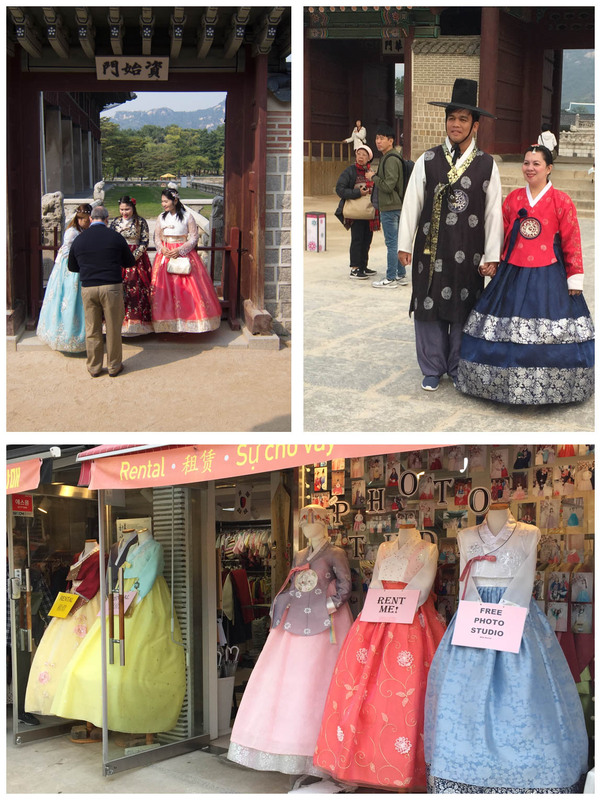 We wandered around Insadong, before spotting one of the recommended Manda dumpling chains. We counted ourselves lucky to get a seat and by the time we left there was a line waiting for a place. Dumplings and more dumplings, Buchon Handmade Dumplings were definitely handmade and definitely delicious. So good we returned there for our final lunch. Next door was the Ssamzigli Mall, an excellent collection of small boutique artisan shops. At the top were some sculptures that delighted Andrew and a Poop cafe. In Korea poop is considered lucky and this cafe has poop shaped cushions, cups of coffee in ceramic toilet cups and lots & lots of notes from previous customers written on poop shaped paper. The coffee was suprisingly good. Dinner was a Korean classic cuisine, Chicken and Beer. Chimaek ("chi" for chicken and "maek" for maekju, Korean for beer) has become part of the food culture of the country – and for us it was an easy meal. Andrew thought the bowls on each table for the discarded bones were a great idea, but this is unlikely to be implemented in our own daily lives. And I think they might have been a little distraught by both of us picking up our chicken pieces with our fingers, as well as with our forks and chopsticks. We were the only people in the restaurant given a plastic glove to wear! But we demolished a large plate of crispy tasty chicken. Day 2 was much easier going after a good nights sleep. We headed off to the very good National Museum of Korea. The top floor was very quiet we had it to ourselves. It was busier on the ground floor with children being given lessons about various subjects. A stunning place and recommended. One of the fascinating exhibits was devoted to the Sinan Shipwreck of 1323, but only rediscovered in 1975 when local fishermen started catching pottery in their nets. 24,000 pieces of pottery, sandalwood, coins left China, probably destined for Japan, but ended up on the Korean sea-bed and later in the museum. Andrew was particularly fascinated by the baby bath (bottom left of this picture) and the bell (right) which was made in 1010. Back into Itaewon, which has a strong foreigner history driven by the American Military base located there. We walked alongside it on our way to a craft brewery for a beer and some Eggs Benedict for lunch. After lunch we walked through the Namsan gardens and back to our hotel back in Insadong. After a rest on the bed we headed off to a traditional Korean BBQ. The ladies looked after us turning our meat, telling us what to eat and being generally lovely. We went to NZ to see family, friends, ski and look at the Bannockburn section. Paula only had 9 days before returning to work and Andrew managed 15 days. Flying into Queenstown from Sydney we had 30 minutes circling (holding pattern) the Mount Aspiring National Park, perfect reflections from the lakes on a clear blue-sky day before landing at Queenstown. It is always a question as to whether one has the right winter clothes when departing from Asia and heading to the NZ winter. We did OK. In the South Island we did enjoy our family visits and hospitality. Mackersy’s in Arrowtown, Rae’s in Invercargill, and Jackson’s in Dunedin. Peter and I did go and visit our parents bridesmaid Marjory who told us we had made her day. The driving on the quiet roads in Central Otago, Southland – Catlins and seeing the rural flax bushes, small towns and coast was a treat. We had 4 nights with the Shepherds based at Pisa Mooring 10 minutes out from Cromwell. This enabled evening meals with Phillipa, Yannick and the boys, some skiing at Cardrona, sightseeing at the Snow Farm, revisit to the Cardrona Hotel (Andrew and Peter first visited it 50 years ago) and around Hawea Flat and Tarras. Paula passed on the skiing and visited some family and friends in Cromwell and Alexandra. We went to the Bannockburn section and pegged out the concept plan. We concluded that swapping the front left and right part of the plan would be better to enable better use of the section. Given the building work going on nearby we determined that a fence would be sensible to deter the section being used as a parking lot. With “Farmer Pete” being about to direct operations (purchasing waratahs, rope and a big hammer) and executing the fencing a job was well done. We flew to Wellington collected the old Camry from Chloe and headed up to coast for a chat with the Macaskill’s. Impressed with the home brew tasting. We had a fun evening with Harkness team at Waikanae and enjoyed the sea view to Kapiti and the memorable flowering native, which looked very much like a very big stalk of aspargus. Saturday am it was back to Wellington, no change at Rankin St (being nosey), visit to the Wales and a catchup with Chloe, Aidan, Georgia and Bella. They were a busy and happy team. A night at the airport hotel as Paula hit the airport track at 4.30am for Laos and I did the 8 am flight to Christchurch. Great to see Chazzy, Simon, Izzie and Livy at the airport and then we went to the Botanical Garden for coffee and a walk. A lovely sunny winter day and we walked into the centre of town to see what progress had been made with the re build. There are still many bare pieces of land and it doesn’t have the critical mass to make the centre hum as it use to do. The Witheford’s garden is spacious and sunny so plenty of room to play and invite the neighbouring kids. Monday morning was the walk to school with Simon and the girls as Chazz was teaching pilates. A visit to City Art gallery and some more city centre walking was interesting. An enjoyable trip to Christchurch. Back to Wellington on Tuesday to stay with the KS team. They do have a lovely warm sunny home and there is some good walking around the hills in Miramar and lovely views. Had a great lunch with the Burns at the old favourite “Olive Café” in Cuba St. Had coffee with Miranda and picked up some of the local gossip. I could tell her about brother Stewart in Vientiane. Wellington is blessed with Moore Wilson’s and the bag was topped up with wine, food, chocolate and Paula’s specified items. It was a packing challenge, but all went well with the Friday 4.30am departure and safe travel back to Laos.